The stadium is owned by Millennium Stadium plc, a subsidiary company of the Welsh Rugby Union (WRU). The architects were Bligh Lobb Sports Architecture. The structural engineers were WS Atkins and the building contractor was Laing. The total construction cost of the stadium was £121 million, of which the Millennium Commission funded £46 million. 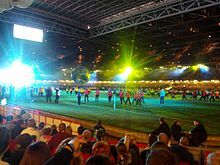 The Millennium Stadium opened in June 1999 and its first major event was an international rugby union match on 26 June 1999, when Wales beat South Africa in a test match by 29–19 before a crowd of 29,000. With a total seating capacity of 74,500, it is the third-largest stadium in the Six Nations Championship behind the Stade de France and Twickenham. It is also the second-largest stadium in the world with a fully retractable roof and was the second stadium in Europe to have this feature. Listed as a category four stadium by UEFA, the stadium was chosen as the venue for the 2017 UEFA Champions League Final, which took place on 3 June 2017. In 2015, the Welsh Rugby Union announced a 10-year sponsorship deal with the Principality Building Society that saw the stadium renamed as the "Principality Stadium" from early 2016. Until 1969, Cardiff RFC and Wales both played their home matches on the same pitch at Cardiff Arms Park, but all this changed in the 1969–70 season. As a result of an agreement between Cardiff Athletic Club and the WRU, the National Stadium project established that a new stadium for international matches and events was required, with Cardiff RFC moving to a new purpose built stadium on the original cricket ground at the site of the former Cardiff Arms Park stadium. By 7 April 1984 the National Stadium was officially opened. However, in 1994, a redevelopment committee was set up to consider redeveloping the National Stadium, and by 1995 the WRU had been chosen to host the 1999 Rugby World Cup. In 1995, the National Stadium, which was designed in 1962, only had a capacity of 53,000; other nations' stadia, such as Twickenham (England) with a capacity of 75,000, and Murrayfield Stadium (Scotland) with a capacity of 67,000, had overtaken it. France was also about to build the Stade de France, which would have a capacity of more than 80,000 for the 1998 FIFA World Cup. The original capacity of the National Stadium was 65,000, but this had been reduced to 53,000, due to the Taylor Report. 11,000 of 53,000 capacity was on the East Terrace and the conversion to an all-seater stadium would have reduced the stadium capacity still further to just 47,500. The options for the new stadium included adding a third tier to the existing National Stadium, or moving to a new site. This last option was discounted because it would have required a vast car parking facility, and that would have put severe short-term pressures on the local transport infrastructure, creating traffic jams and pollution. The committee eventually chose a new stadium on the same site but with considerable increase in its capacity. It would also involve moving the alignment of the stadium from west-east to north-south. This was the option supported by the Millennium Commission. It would become the fourth redevelopment of the Cardiff Arms Park site. It was also decided that the new stadium should have a sliding roof to accommodate a multi-use venue, with a grass pitch for rugby and football. The only other sliding roofs in Europe at the time were at two Dutch stadia – the Amsterdam Arena, completed in 1996 with a capacity of 50,000; and Gelredome in Arnhem, a 30,000-capacity ground built from 1996 to 1998. To remain on the Arms Park site, additional space had to be found to allow safe access and to provide room for the increased capacity and improved facilities. This was achieved by the purchase of adjacent buildings to the south and east and by the construction of a new £6 million River Walk by the River Taff on the western side of the stadium. By 1999, the Millennium Stadium had replaced the National Stadium, Cardiff Arms Park, as the national stadium of Wales for rugby union and association football international matches. Cardiff RFC continued as before to play at Cardiff Arms Park rugby ground, which had replaced the cricket ground in 1969. The stadium was designed by a team led by Bob Sheard at Lobb Sport Architecture, who later merged with HOK Sport to become Populous. The building contractor was Laing and the structural engineers were WS Atkins. Mike Otlet of WS Atkins designed the stadium's retractable roof. Cimolai S.p.A. from Italy fabricated and erected the 72 steel plane frames for the stands and all the 4,500 components of the roof. Construction involved the demolition of a number of buildings, primarily the existing National Stadium (Cardiff Arms Park), Wales Empire Pool (swimming pool) in Wood Street, Cardiff Empire Telephone Exchange building (owned by BT) in Park Street, the newly built Territorial Auxiliary & Volunteer Reserve building in Park Street, and the Social Security offices in Westgate Street. The total construction cost of the stadium was £121 million, which was funded by private investment and £46 million of public funds from the Millennium Commission, the sale of debentures to supporters (which offered guaranteed tickets in exchange for an interest-free loan), and loans. The development left the WRU heavily in debt. The Millennium Stadium was named as such in recognition of the Millennium Commission's contribution to the building. The stadium was first used for a major event on 26 June 1999, when Wales played South Africa in a rugby union test match before a crowd of 29,000. Wales won 29–19: the first time they had ever beaten the Springboks. On 8 September 2015 it was announced that the Millennium Stadium would be renamed Principality Stadium as the result of a 10-year naming rights deal with the Principality Building Society. Some fans expressed opposition on social media. On 22 January 2016, the Millennium Stadium was officially renamed as the Principality Stadium. The new name, written bilingually ("Stadiwm Principality Stadium") and covering 114 square metres (1,230 sq ft) of the upper stadium, was lit up at a special evening ceremony, to be followed by a festival to encourage grassroots rugby. The change of name also meant a change of logo for the Millennium Stadium. There were three designs shortlisted, and a panel, which included the former Wales international captain Ryan Jones and staff and members of the WRU and Principality Building Society, chose the final design. A spokesperson for the WRU said: "The new stadium logo takes its inspiration from the venue's iconic architecture; four spires, curved frontage and fully retractable roof." The all-seater stadium has the capacity for 74,500 supporters and features a retractable roof, only the second stadium of its type in Europe, and the largest football stadium in the world with this feature, by capacity. Additional seating is sometimes added for special events such as a rugby Test against the New Zealand All Blacks, or for the FA Cup Final. The current record attendance is set at just over 78,000, recorded at the Anthony Joshua v Carlos Takam fight, on 28 October 2017, in which Joshua successfully retained his WBA, IBF and IBO titles. The natural grass turf was made up of a modular system installed by GreenTech ITM. It features built in irrigation and drainage. The pitch itself was laid on top of some 7,412 pallets that could be moved so the stadium could be used for concerts, exhibitions and other events. In May 2014, after much trouble with disease and stability, the surface was removed and replaced with a more resilient interwoven sand based Desso pitch. The four ends of the ground are called the North Stand, the West Stand, the South Stand, and the BT Stand (east). The South Stand was previously known as the Hyder Stand, until Hyder was sold. The stadium has three tiers of seating with the exception of the North Stand, which has two tiers. The lower tier holds approximately 23,500 spectators, the middle tier holding 18,000 and the upper tier holding 33,000 spectators. The stadium was slightly restricted in size due to its proximity to Cardiff Rugby Club's home in the adjacent smaller stadium within Cardiff Arms Park. The WRU were unable to secure enough funding to include the North Stand in the new stadium, and the Millennium Commission would not allow any of its funds to be used in any way for the construction of a new stadium for Cardiff RFC. The WRU held talks with Cardiff RFC to see if it would be possible for the club to either move or secure funding for the Cardiff Arms Park to be re-developed, but these were unsuccessful. The stadium thus had to be completed with a break in its bowl structure in the North Stand, known colloquially as the Cardiff fault or Glanmor's Gap, after Glanmor Griffiths, then chairman of the WRU and now a former president. The superstructure of the stadium is based around four 90.3-metre (296 ft) masts. The stadium was built from 56,000 tonnes of concrete and steel, and has 124 hospitality suites and 7 hospitality lounges, 22 bars, 7 restaurants, 17 first aid points, 12 escalators and 7 lifts. The stadium has 7 gates for access to the site; Gate 1 is from the River Walk via Castle Street (to the north), Gates 2 and 3 are via Westgate Street (to the east), Gate 4 is for Security only also via Westgate Street, Gate 5 is via Park Street (to the south) and Gates 6 and 7 are via the Millennium Plaza (also to the south). Any future renovation to the stadium will involve replacing the old North Stand of the former National Stadium with a new one similar to the three existing stands of the new Millennium Stadium. This will make the stadium bowl-shaped and will increase its capacity to around 80,000. It will resolve the existing problems of deteriorating concrete quality on the old structure in the north stand. In each of the stadium's bars, so-called "joy machines" can pour 12 pints in less than 20 seconds. During a Wales versus France match, 63,000 fans drank 77,184 pints of beer, almost double the 44,000 pints drunk by a similar number of fans at a game at Twickenham. The stadium has a resident hawk named "Dad", who is employed to drive seagulls and pigeons out of the stadium. In 2005 the stadium installed an "Arena Partition Drape System" – a 1,100 kg (2,400 lb) black curtain made up of 12 drapes measuring 9 m × 35 m (30 ft × 115 ft) – to vary the audience from a capacity of over 73,000 down to between 12,000 and 46,000, depending on the four different positions that it can be hung. The curtains can be stored in the roof of the stadium when not in use. The £1 million cost of the curtain was funded by the stadium, the Millennium Commission, its caterers Letherby and Christopher (Compass Group) and by the then Wales Tourist Board. The curtain was supplied by Blackout. In May 2015, the chairman of the WRU, Gareth Davies, announced that the stadium would be fitted with new seats, replacing the original seats from 1999 at a cost of £4 million to £5 million, which would be completed by 2018. In addition a new £3.1 million Desso hybrid pitch will be installed. In February 2019, the stadium increased its disabled capacity from 168 to 214 at a cost of around £100,000. As a result, the overall capacity of the stadium was reduced from 74,500 to 73,931. 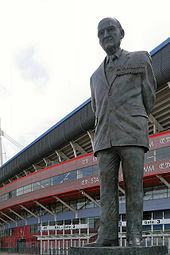 A statue of Sir Tasker Watkins, the former WRU president between 1993 and 2004, was commissioned to stand outside Gate 3 of the stadium. The bronze statue, 9 feet (2.7 m) tall, was sculpted by Llantwit Major based sculptor Roger Andrews. The Welsh Government contributed £50,000, as did Cardiff Council. It was official unveiled on 15 November 2009 by his daughter, Lady Mair Griffith-Williams. As well as international rugby union and association football, the Millennium Stadium has hosted a variety of sports, including, rugby league (including the Challenge Cup Final on 3 occasions between 2003 and 2005, the opening ceremony of the 2013 Rugby League World Cup and Welsh Rugby League internationals), speedway, boxing, the Wales Rally Great Britain stage of the World Rally Championship, Monster Jam and indoor cricket. The indoor cricket match between The Brits and a Rest of the World team for the Pertemps Power Cricket Cup, which took place on 4 and 5 October 2002. The stadium is the home of the Welsh rugby union team, who play all of their home fixtures at the venue. These games include those during the Six Nations, as well as the Autumn Internationals against nations from the Southern Hemisphere. Apart from the national team, the stadium has also hosted Heineken Cup finals on five occasions. In total, the site, including the National Stadium, has hosted the final of the Heineken Cup on seven occasions. The stadium has also been used for Celtic League games, and the semi-finals of the Anglo-Welsh Cup in 2006 and 2007. Since 2013, the Millennium Stadium hosts the Judgement Day, a double-header fixture of the four Welsh Pro12 teams. The 2015 edition had 52,762 spectators, the highest in the history of the league. The stadium hosted the first match in the 2005 British and Irish Lions tour to New Zealand when they drew 25–25 against Argentina in a warm-up test match. On 30 March 2011, the stadium hosted the Welsh Varsity rugby match for the first time in the history of the match between the senior teams of Cardiff University and Swansea University. The stadium is used alternating years with Liberty Stadium in Swansea. The Welsh Varsity event celebrated its 20th anniversary in 2016. 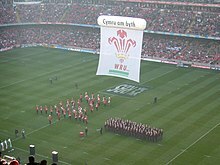 The Welsh Rugby Union hosted the 1999 Rugby World Cup with the Final being played at the stadium. The stadium also hosted 3 pool matches and 1 quarter-final match (New Zealand 18–20 France) of the 2007 Rugby World Cup. On 15 October 2011, the stadium was open to Welsh Rugby Union fans free of charge, providing that they wear red so that they could watch a live screening of the 2011 Rugby World Cup semi-final between Wales and France that was played at Eden Park, Auckland, New Zealand. The match was screened on the stadium's existing large screens, on all of their television screens and on a screen that was brought in for the occasion. The same was done for the Bronze Final between Wales and Australia which saw Wales defeated and take fourth place. The stadium hosted six pool matches, including two of Wales's, and two quarter-final matches during the 2015 Rugby World Cup. The stadium first hosted rugby league football during the 2000 World Cup: a double header featuring Cook Islands versus Lebanon and Wales versus New Zealand that attracted a crowd of 17,612. It was again used as Wales' home ground during the 2002 New Zealand rugby league tour of Great Britain and France when they again hosted the Kiwis this time attracting 8,746 spectators. The Stadium has hosted three Challenge Cup Finals, which are usually played at Wembley, from 2003 to 2005. In 2003 the Bradford Bulls defeated the Leeds Rhinos 22–20 in front of 71,212 fans. St. Helens defeated Wigan 36–16 in 2004 in front of 73,734 fans, while Hull F.C. defeated Leeds 25–24 in 2005 in front of 74,213 fans, the largest rugby league crowd at the stadium. Also, in 2007 the stadium hosted the inaugural Millennium Magic weekend. This was a two-day event in May when an entire round of Super League matches were played, three games on the Saturday and three games on the Sunday. The event was deemed a success by the sport's governing body, the RFL, and second Millennium Magic event took place in May 2008, although the 2009 and 2010 events were held at Murrayfield Stadium and were renamed Magic Weekend. In 2011, Magic Weekend moved back to Cardiff with the opening round of Super League being played. 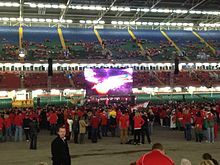 On Saturday 26 October 2013, the Millennium Stadium hosted the opening ceremony and the first two fixtures of the 2013 Rugby League World Cup: a double-header featuring Wales against Italy and England against title favourites and eventual tournament champions Australia. This double header produced an overall attendance of 45,052 which is an International rugby league record at the stadium. From 2000 to 2011, the stadium was the almost-permanent home of Welsh football. The national team played the vast majority of home matches at the Millennium Stadium, with a handful of friendly matches once or twice a year at the Racecourse Ground, Wrexham or Liberty Stadium, Swansea. The first Welsh football game at the stadium was played against Finland in 2000, and drew a then-record home crowd for Welsh football of over 66,000. This has since been beaten on several occasions. However, since 2011, the majority of home games have been played at the smaller Cardiff City Stadium, the home of Cardiff City. The stadium became notorious for an apparent "away team hoodoo"; the first 11 major cup finals were all won by the teams occupying the home dressing room. Stoke City beat Brentford 2–0 in 2002 to end the "hoodoo", after Paul Darby carried out a feng shui blessing. Liverpool were the first team to win the FA Cup at the Millennium Stadium in 2001 after beating Arsenal 2–1. They were also the first team to win the League Cup at the Stadium, defeating Birmingham City in a penalty shoot-out earlier that year. Liverpool also won the last FA Cup Final to be played at the Millennium Stadium in 2006, beating West Ham United 3–1 in a penalty shoot-out that followed a 3–3 draw after extra time in what was billed as 'the best cup final of the modern era'. The Football League Third Division play-offs in 2003 saw AFC Bournemouth beat Lincoln City 5–2. In this game, Bournemouth set a new record for the most goals scored by one team in a single match at the stadium. This record has since been matched but not beaten. The last domestic cup match played was when Doncaster Rovers beat Bristol Rovers 3–2 after extra time in the Football League Trophy Final on 1 April 2007. It was suggested that the stadium would have been one of the venues of a proposed UEFA Euro 2016 championship hosted jointly by Wales and Scotland. However, the bid did not reach the formal UEFA selection stage, having been abandoned by the Welsh and Scottish Football Associations for financial reasons. In April 2014, the FAW did submit a formal bid to host three group matches and either a round of 16 match or a quarter-final at Euro 2020, which UEFA planned to host at 13 venues across Europe. When the host venues were voted on in September 2014, the Millennium Stadium lost out by a single vote behind Glasgow's Hampden Park, a decision that FAW chief executive Jonathan Ford put down to UEFA politics. On 30 June 2015, the Millennium Stadium was chosen as the venue for the 2017 UEFA Champions League Final. 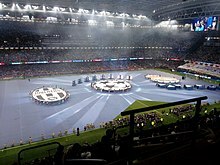 UEFA rules meant it could not be branded as the Principality Stadium during the event, resulting in all titles and logos – as well as those of other non-UEFA sponsors – being covered or removed for the duration. The game was played on 3 June 2017 between Italian club Juventus and Spanish club Real Madrid, in a repeat of the 1998 final; Real Madrid won the match 4–1. When London was selected as the host city for the 2012 Summer Olympics, the Millennium Stadium was named as one of the six venues for the football competition. It had the distinction of hosting the opening event of the Games – a 1–0 win for the Great Britain women's team against New Zealand – as well as four other group games and a quarter-final in the women's tournament, and three group games, a quarter-final and the bronze medal match in the men's. There have been five nights of boxing at the stadium. On 8 July 2006 when Matt Skelton beat Danny Williams for the Commonwealth heavyweight title. On 7 April 2007, Joe Calzaghe beat Peter Manfredo to retain his WBO super middleweight belt. On 3 November 2007, Calzaghe beat Mikkel Kessler to retain his WBO super middleweight belt and win the WBA and WBC super middleweight titles. On 28 October 2017 Anthony Joshua successfully retained his WBA (Super), IBF, and IBO heavyweight titles against mandatory challenger Carlos Takam with a 10th round stoppage. On 31 March 2018, it hosted the World heavyweight unification fight between Anthony Joshua, holder of the WBA and IBF belts, and Joseph Parker, holder of the WBO belt. Joshua beat Parker on points. In 2001 it staged its first ever motorsport event, hosting the Speedway Grand Prix of Great Britain, and has done every year since, in 2010 attracting a record crowd of 44,150. The temporary motorcycle speedway track is 278 metres (304 yards) in length and with sections of the stadiums lower seating bowl covered, the capacity of the stadium for the Grand Prix is set at 62,500. In September 2005 the stadium was host to the first ever indoor stage of the World Rally Championship during the Wales Rally Great Britain. The lower tier of the stadium was removed to create a figure-of-eight course. In addition to this, the stadium has also hosted Supercross events. In October 2007, the stadium first hosted the UK leg of the Monster Jam trucks Europe tour, and returned in June 2008, again in 2009, 2010 and 2016. The stadium has also on occasion been used as a venue for shooting film and television productions. "Dalek", an episode of the 2005 season of the BBC science fiction television series Doctor Who, was shot primarily on location at the stadium, using its underground areas to stand in for an underground base in Utah, United States in the year 2012. The location shooting for the episode took place during October and November 2004. The underground areas of the stadium were used again in Doctor Who for the 2005 Christmas special, "The Christmas Invasion". The area was used as the headquarters for UNIT, based under the Tower of London. The episode was broadcast on Christmas Day 2005. Shots of the Stormcage in which River Song is incarcerated in series 5 and 6 are also in the stadium. The Hindi film Kabhi Khushi Kabhi Gham was also filmed there. Sébastien Foucan jumped over the gap of the opening of the stadium roof in the parkour documentary "Jump Britain". The inaugural Express Eventing International Cup took place at the stadium on 30 November 2008. The three-event competition made up of dressage, cross-country and show jumping all took place over the one day. The event was won by Oliver Townend. The stadium has also been used for a variety of musical events, including the Manic Street Preachers concert held on Millennium Eve, and, on the following day, a recording of the BBC's Songs of Praise, which attracted an attendance of 60,000. Tina Turner performed a sold-out concert at the stadium during her highly successful Twenty Four Seven Tour in 2000. Welsh rockers Stereophonics have played two sold out shows at the stadium: In July 2001 as part of their two-day "A Day at the Races" festival which would later be released to DVD and in 2003, shortly after the departure of the late Stuart Cable. American rock band Bon Jovi played the venue during the One Wild Night Tour in 2001. At the end of January 2005, the stadium hosted a tsunami relief concert in aid of the victims of the 2004 Indian Ocean earthquake and tsunami, with Eric Clapton headlining the event. The stadium has also been host to Madonna on two occasions, the first in July 2006 when she opened the UK leg of her Confessions Tour, and most recently in August 2008 when she kicked off her Sticky & Sweet Tour at the stadium. 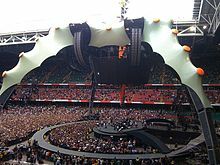 Other performers who have played at the stadium include Robbie Williams as part of his Weddings, Barmitzvahs & Stadiums Tour, U2 as part of their Vertigo Tour, Red Hot Chili Peppers as part of their By the Way tour, The Rolling Stones as part of their A Bigger Bang Tour, R.E.M. as part of their Monster tour and again for their Around the Sun tour. Paul McCartney also played at the stadium as part of his Up and Coming Tour, and The Police performed there as part of their Reunion Tour. In late 2005, Oasis played at the stadium during their Don't Believe the Truth Tour and again on their Dig Out Your Soul Tour in 2009. 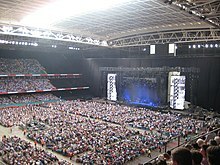 In 2008, the stadium hosted Neil Diamond and Bruce Springsteen with the E Street Band as part of their Magic Tour, On 22 August 2009, U2 again played at the stadium, as part of their European leg of their U2 360° Tour, playing to a record-breaking concert attendance of 73,354. The stadium offers conferencing facilities via the foodservice organisation Compass Group. The facilities consist of six individually designed lounges and 124 pitch-facing executive box suites. In addition to business events, the facilities are also available for dinners, banquets, balls, parties and weddings receptions. ^ a b "Principality Stadium: Disabled spaces increased by 30%". BBC News. 14 February 2019. Retrieved 14 February 2019. ^ "Anthony Joshua set to take Muhammad Ali's 39-year record against Carlos Takam at Principality Stadium". Trinity Mirror. Retrieved 30 March 2018. ^ a b c d e "Facts & Figures". Principality Stadium. 2016. Archived from the original on 29 October 2016. Retrieved 5 July 2016. ^ "End of an era, as Heineken Cup final between Toulon and Saracens marks last game on grass at the Millennium Stadium". Welsh Rugby Union. Archived from the original on 7 February 2009. Retrieved 11 September 2015. ^ a b c d "The Economic Impact of the Millennium Stadium". Cardiff Council. Retrieved 7 September 2008. ^ "Pulling off the wow factor". Federation of Master Builders. Archived from the original on 10 October 2007. Retrieved 28 August 2008. ^ a b "Millennium Stadium Information". Millennium Stadium. Archived from the original on 3 July 2015. Retrieved 28 August 2008. ^ "About Millennium Stadium plc". Welsh Rugby Union. Archived from the original on 22 September 2008. Retrieved 24 August 2008. ^ a b "Millennium projects open in Wales and Northern Ireland". Millennium Commission. Archived from the original on 3 February 2009. Retrieved 24 August 2008. ^ a b "Millennium Stadium celebrates fifth anniversary". NewsWales. 25 June 2004. Archived from the original on 28 August 2004. ^ a b "Fact About Wales and the Welsh (40. Cardiff has the world's largest retractable-roof arena)". Britannia.com. Retrieved 7 September 2008. ^ a b c d e "About Millennium Stadium". Millennium Stadium. Archived from the original on 9 October 2007. Retrieved 24 August 2008. 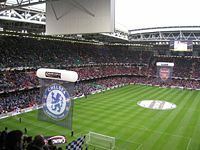 ^ a b "Champions League: Millennium Stadium to host 2017 final". BBC Sport. 30 June 2015. Retrieved 30 June 2015. ^ "Millennium Stadium: Cardiff venue to be renamed Principality Stadium". BBC Sport (British Broadcasting Corporation). 8 September 2015. Retrieved 8 September 2015. ^ "Millennium Stadium to be renamed Principality Stadium in historic naming rights deal with WRU". Wales Online. Retrieved 11 September 2015. ^ Mosalski, Ruth (31 December 2015). "It's just three weeks until the Millennium Stadium officially becomes the Principality". WalesOnline. Media Wales. Retrieved 1 January 2016. ^ a b c d Harris CBE LLD (Hons), Kenneth M (1984). "The Story of the Development of the National Rugby Ground 7 April 1984". Welsh Rugby Union. ^ a b c d e f "In the heart of the city". PanStadia International. Archived from the original on 1 December 2008. Retrieved 24 August 2008. ^ "Projecten: Gelredome, Arnhem" (in Dutch). Alynia Architecten. Retrieved 15 February 2009. ^ "CRFC History". Cardiff RFC. Archived from the original on 14 May 2008. Retrieved 27 August 2008. ^ "Ascot set for switch". BBC. 28 March 2003. Retrieved 1 October 2010. ^ "Ascot set for switch". BBC. Retrieved 1 October 2010. ^ Greeman, Adrian. "Up for the cup". cranestodaymagazine. Archived from the original on 21 January 2013. Retrieved 5 May 2012. ^ "Two years – and one awesome stadium". BBC. 2 September 1999. Retrieved 24 August 2008. ^ "Cardiff stadium 'financial disaster'". BBC. 9 September 1999. Retrieved 28 August 2008. ^ a b "Principality buys naming rights for Millennium Stadium". ITV News. 8 September 2015. Retrieved 24 January 2016. ^ Tom Cary (8 September 2015). "Millenium Stadium to be renamed Principality Stadium next year in 'significant' deal for Wales Rugby Union". The Telegraph. Retrieved 12 February 2016. ^ Mosalski, Ruth (21 January 2016). "It's almost time to say goodbye to the Millennium Stadium as Principality Stadium goes up in lights". Wales Online. Retrieved 22 January 2016. ^ Mosalski, Ruth (22 January 2016). "End of an era as home of Welsh rugby renamed". South Wales Echo. p. 26. ^ a b "Cardiff's Millennium Stadium rebrands as Principality Stadium". Design Week. Retrieved 30 January 2016. ^ "Millennium Stadium, Cardiff, Wales". GreenTech. Archived from the original on 4 October 2008. Retrieved 24 August 2008. ^ "Cardiff pioneers new turf". Fat Pig Productions CC. Archived from the original on 20 September 2008. Retrieved 24 August 2008. ^ "Millennium Stadium to have new hybrid surface". BBC Sport. 23 May 2014. Retrieved 23 January 2016. 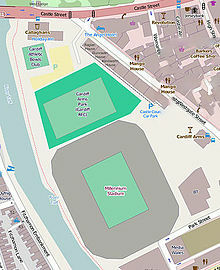 ^ "Millennium Stadium Information (Millennium Stadium Seating Plan)". Millennium Stadium. Archived from the original on 3 June 2007. Retrieved 7 September 2008. ^ "Hyder Stand South". Liverpoolfc.tv. Archived from the original on 26 September 2006. Retrieved 7 September 2008. ^ Stadia, Arenas and Grandstands By P. Thompson, J. J. A. Tolloczko, Jean Benedetti, J. N. Clarke, Concrete Society. Taylor & Francis, 1998 & Google Books. 18 June 1998. ISBN 978-0-419-24040-2. Retrieved 4 September 2008. ^ "Presidents of the WRU". Welsh Rugby Union. Retrieved 24 August 2008. ^ "BBC Sport Online's Mark Barden looks at Cardiff's Millennium Stadium". BBC. 4 January 2001. Retrieved 24 August 2008. ^ "Stadium Location Content". Millennium Stadium. Archived from the original on 3 June 2007. Retrieved 27 August 2008. ^ Bevan, Nathan (8 July 2007). "Concrete cancer strikes stadium". Wales on Sunday. Retrieved 24 August 2007. ^ "48 hours in Cardiff" (PDF). The Visitwales Centre. Archived from the original (PDF) on 3 October 2008. Retrieved 24 August 2008. ^ "Millennium Stadium Hawk Takes A Break". Millennium Stadium. 22 March 2007. Archived from the original on 7 October 2007. ^ "REM Bring Curtain Up on New Arena". BBC. 11 July 2005. Retrieved 5 September 2010. ^ "Gallery, Millennium Stadium Cardiff". Blackout. Retrieved 5 September 2010. ^ "Welsh Rugby Union to spend £5m on new seats at 74,500 capacity Millennium Stadium". WalesOnline. 15 May 2015. Retrieved 1 July 2015. ^ "Sir Tasker statue for Millennium Stadium". WalesOnline. 21 August 2008. Retrieved 16 November 2015. ^ "Sir Tasker Watkins Statue Unveiled". Welsh Rugby Union. 15 November 2009. Retrieved 16 November 2015. ^ "History of the Millennium Stadium". Millennium Stadium. Archived from the original on 8 June 2011. Retrieved 27 November 2009. ^ "Power Cricket To Return To Millennium Stadium in 2003". Chipping Sodbury Cricket Club. Archived from the original on 20 August 2008. Retrieved 27 November 2009. ^ "Pertemps sponsors international cricket". Pertemps. Retrieved 27 November 2009. ^ "Cardiff to host Heineken Cup final for a record seventh time". BBC. 17 July 2013. Retrieved 25 May 2014. ^ "The Seventh Heineken Cup Final". ERC and Westgate. Archived from the original on 4 February 2009. Retrieved 29 August 2008. ^ "Munster fulfil their destiny". ERC and Westgate. Archived from the original on 4 June 2008. Retrieved 29 August 2008. ^ "Munster claim second Heineken Cup". ERC and Westgate. Archived from the original on 4 August 2008. Retrieved 29 August 2008. ^ "Leinster 33–22 Northampton". BBC. 21 May 2011. Retrieved 25 May 2014. ^ "Heineken Cup final: Saracens 6–23 Toulon". BBC. 21 May 2011. Retrieved 25 May 2014. ^ "Welsh Varsity | The Biggest Student Sporting Event in Wales". welshvarsity.com. Retrieved 7 December 2016. ^ Davies, Sean (15 September 2007). "Wales 20–32 Australia". BBC. Retrieved 29 August 2008. ^ Malin, Ian (17 September 2007). "Fiji send Wales a mixed message". The Guardian. London. Retrieved 29 August 2008. ^ Hassan, Nabil (20 September 2007). "Wales 72–18 Japan". BBC. Retrieved 29 August 2008. ^ Fotheringham, William (8 October 2007). "France postpone party to avoid another hangover". The Guardian. London. Retrieved 29 August 2008. ^ "Millennium Magic to start 2011 Super League season". BBC. 13 August 2010. Retrieved 14 August 2010. ^ Fletcher, Paul (26 October 2013). "Rugby League World Cup 2013: Tournament begins with a bang". BBC Sport. Retrieved 27 October 2013. ^ "'Old' stadium claims world record". BBC. 20 August 2008. Retrieved 7 September 2008. ^ "Wales v Bulgaria – Friendly. – Liberty Stadium Swansea. Tuesday 15th August 2006". dragonsoccer.co.uk. Retrieved 7 September 2008. ^ "Wales 1–2 Georgia". BBC. 20 August 2008. Retrieved 7 September 2008. ^ "FA Cup bid for Wales". BBC. 30 May 2000. Retrieved 3 September 2008. ^ "Football: Hughes and Wales hope Finland feel the force of Giggs". The Independent, London also CNET Networks, Inc., a CBS Company. Archived from the original on 11 February 2009. Retrieved 3 September 2008. ^ "Wales national football team results 2010–14". Welsh Football Online. Retrieved 21 June 2015. ^ a b "Division Two Play-off Final: Twist to tale after Stoke end hoodoo". The Daily Telegraph. 11 May 2002. Retrieved 31 January 2013. ^ "McFengshui Mojo Missing at Millennium Stadium". Feng Shui Ultimate Resource. Archived from the original on 30 October 2007. Retrieved 27 August 2008. ^ "Arsenal Undone as Owen's Late Double Gives Liverpool Cup". International Herald Tribune. Archived from the original on 6 May 2008. Retrieved 4 September 2008. ^ Lacey, David (2001-02-24). "There's nothing like a knockout". the Guardian. Retrieved 2018-10-14. ^ "Blues shot down as Liverpool lift cup". 2001-02-25. Retrieved 2018-10-14. ^ Pope, Bruce (2 April 2007). "Millennium Stadium memories". BBC. Retrieved 4 September 2008. ^ "Leeds United Versus Bournemouth". Vital Network. Archived from the original on 30 April 2008. Retrieved 4 September 2008. ^ "Rovers match marks city final end". BBC. 1 April 2007. Retrieved 3 September 2008. ^ Ley, John (10 January 2001). "Welsh eye European final". The Daily Telegraph. London. Retrieved 18 April 2009. ^ Ziegler, Martyn (14 December 2001). "Old Trafford lands 2003 final". The Independent. London. Retrieved 18 April 2009. ^ "Wales eye joint Scotland Euro bid". BBC. 19 April 2007. Retrieved 3 September 2008. ^ "Wales and Scotland abandon Euro 2016 bid". The Guardian. 2 March 2009. Retrieved 21 June 2015. ^ "Euro 2020: Football Association of Wales confirms Euro 2020 bid". BBC Sport (British Broadcasting Corporation). 25 April 2014. Retrieved 21 June 2015. ^ "Euro 2020: Politics played a part in Wales missing out – Ford". BBC Sport (British Broadcasting Corporation). 19 September 2014. Retrieved 21 June 2015. ^ Doel, Jon (23 May 2017). "The Principality Stadium sign has started to be removed as home of Welsh rugby changes name for Champions League final". Wales Online. Media Wales. Retrieved 8 February 2018. ^ McNulty, Phil (3 June 2017). "Juventus 1-4 Real Madrid". BBC Sport. Retrieved 8 February 2018. ^ "Millennium Stadium". London2012.com. Archived from the original on 3 January 2013. Retrieved 2 August 2012. ^ "Football – event schedule". BBC Sport (British Broadcasting Corporation). 30 March 2012. Retrieved 28 July 2012. ^ "Millennium Stadium, Cardiff, Wales, United Kingdom". BoxRec. Retrieved 3 January 2010. ^ "boxer: Matt Skelton". BoxRec. Retrieved 3 January 2010. ^ a b "boxer: Joe Calzaghe". BoxRec. Retrieved 3 January 2010. ^ "Anthony Joshua beats Joseph Parker on points to add WBO world heavyweight title". BBC. Retrieved 2018-10-19. 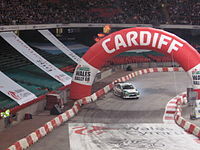 ^ "Record Crowds in Cardiff for 10th Speedway GP". Millennium Stadium. 12 July 2010. Archived from the original on 27 September 2011. Retrieved 27 June 2011. ^ "Stadium first for world rally". BBC. 17 September 2005. Retrieved 3 September 2008. ^ "Crockard second in Wales". BBC. 6 December 2004. Retrieved 3 September 2008. ^ "Monster Jam". Millennium Stadium. Archived from the original on 7 October 2007. Retrieved 3 September 2008. ^ "Doctor Who Locations – Millennium Stadium". Christian Graham. Archived from the original on 4 February 2009. Retrieved 4 September 2008. ^ Chowdhury, Saj (25 February 2007). "Live – Carling Cup final". BBC. Retrieved 5 September 2008. ^ "Titles with locations including Millennium Stadium, Cardiff". Internet Movie Database. Retrieved 27 August 2008. ^ "Brits make a clean sweep of Express Eventing". Tricorn Events. Archived from the original on 30 January 2009. Retrieved 21 February 2009. ^ "Manic Street Preachers biography". BBC. Archived from the original on 18 May 2008. Retrieved 4 September 2008. ^ "Fascinating facts about Songs of Praise..." BBC. Retrieved 4 September 2008. ^ "Twenty Four Seven Tour 2000". Official Tina Turner Fan Club. Retrieved 4 September 2008. ^ "Cardiff set to be recreation capital". BBC. 27 June 2001. Retrieved 4 September 2008. ^ "Stadium tsunami gig raises £1.25m". BBC. 23 January 2005. Retrieved 4 September 2008. ^ Grice, Natalie (31 July 2006). "Confessions from a Madonna show". BBC. Retrieved 4 September 2008. ^ "Madonna kicks off huge world tour". BBC. 23 August 2008. Retrieved 4 September 2008. ^ "'Robbie Weekend' draws 120,000 fans". BBC. 16 July 2001. Retrieved 4 September 2008. ^ a b "Stadium hopes for big star names". BBC. 1 June 2005. Retrieved 4 September 2008. ^ "Windsurfing in stadium profit plan". BBC. 23 June 2004. Retrieved 4 September 2008. ^ "Madonna to open tour in Cardiff". BBC. 4 April 2006. Retrieved 4 September 2008. ^ MACCA-Concerts: Up and Coming Tour :: Cardiff, UK 26 June 2010 @Millennium Stadium – MACCA-Central, The Paul McCartney FUNsite. Macca-central.com (26 June 2010). Retrieved 17 July 2013. ^ "Police gig for Millennium Stadium". BBC. 5 March 2007. Retrieved 4 September 2008. ^ "Oasis headline stadium rock gig". BBC. 25 July 2005. Retrieved 4 September 2008. ^ "Low sales blamed as REM move show". BBC. 8 August 2008. Retrieved 4 September 2008. ^ "U2 360 Tour Presented by BlackBerry, Revolutionary Production Design Revealed". Fox Business Network. Archived from the original on 20 March 2009. Retrieved 14 March 2009. ^ "U2 Rock to Record-Breaking Crowd at Millennium Stadium". Millennium Stadium. Archived from the original on 19 July 2011. Retrieved 26 August 2010. ^ "About Compass Group". Compass Group on behalf of Millennium Stadium. Archived from the original on 26 June 2011. Retrieved 24 June 2011. Wikimedia Commons has media related to Millennium Stadium.